GLAND, Switzerland, June 27, 2011 (ENS) – At least 1,060 new species were discovered on the island of New Guinea from 1998 to 2008, but unsustainable logging and plantation agriculture are putting many of these creatures at risk, finds a new study by the global conservation organization WWF. On another of the world’s large islands, Madagascar off Africa’s southeast coast, WWF has produced a separate report documenting the 615 new species that scientists discovered during the decade from 1999 to 2010. New Guinea is the largest tropical island on Earth and is divided between the countries of Papua New Guinea in the east and Indonesia in the west. Here, the third largest rainforest in the world shelters about eight percent of the world’s 250,000 species. More than two-thirds of them are unique to New Guinea and found nowhere else on Earth. About the size of France, Madagascar is the fourth largest island in the world. This island is home to five percent of the world’s plant and animal species, more than 70 percent found nowhere else on Earth. Scientists exploring Madagascar during the past decade have discovered new 41 mammals, including 28 new lemur species. 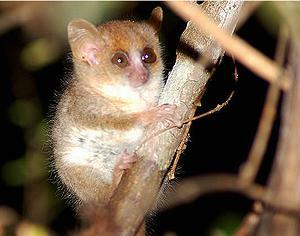 The report describes Berthe’s mouse lemur, Microcebus berthae, discovered in 2000, the smallest of the mouse lemurs and the smallest primate in the world, found in the Kirindy Mitea National Park in western Madagascar. The new finds also include 17 fish, 61 reptiles, 69 amphibians, 42 invertebrates and 385 new kinds of plants. An exceptionally-colored new snake species was discovered in 2010 at the western side of the Makira plateau, within the newly created Makira National Park in the northeast of Madagascar. 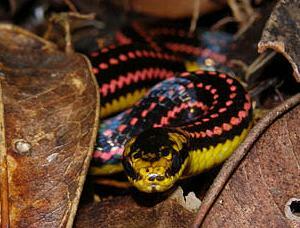 The snake Liophidium pattoni has a black upper side with four pink-red horizontal stripes, fading into blue grey, and a bright yellow underbelly. Two others were discovered in Masoala National Park, a UNESCO World Heritage Site. Yet this species is already at risk as the protected rainforests where it was found in have been recently fragmented due to “an upsurge in illegal logging for precious rosewood destined for markets in China,” the WWF report states. Like New Guinea, the habitats of Madagascar continue to face ever-growing threats, including unsustainable resource extraction including small-scale, and widespread clearance of habitats, primarily for firewood and charcoal production. Secondary threats are caused by subsistence agriculture, livestock grazing, and invasive species, the WWF reports. Analysis of aerial photographs indicates that forest cover decreased by almost 40 percent from the 1950s to about 2000, with a reduction in “core forest” of almost 80 percent. “This forest destruction and degradation threaten thousands of species with extinction,” WWF says in the report, which says Madagascar has already lost 90 percent of its original forest cover. For the unique species of Madagascar, loss of vital habitat is “a disaster” and the “increased access to species has also exacerbated the international trade in Madagascar’s wildlife,” says WWF, which has been doing conservation work on the island for 47 years. 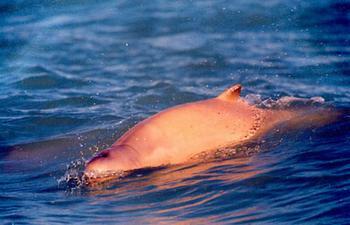 The snub-fin dolphin, Orcaella heinsohni, was once thought to be a member of the Irrawaddy species of dolphin. But in the waters south of New Guinea in 2005 researchers found that snub-fins have different coloration, skull, fin and flipper measurements. That makes them the first new dolphin species recorded for at least 30 years. Scientists believe these dolphins live in protected, shallow, coastal waters adjacent to river and creek mouths in the coastal zones of Australia and Papua New Guinea. The snub-fin dolphin, Orcaella heinsohni, is the first new dolphin species recorded for 30 years. Scientists discovered 71 new fish, among them an extremely rare 2.5 meter-long river shark. Two new birds, 43 reptiles and 134 amphibians as well as 580 invertebrates new to science were also found. 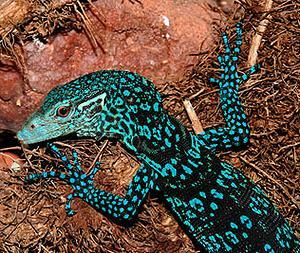 Three new monitor lizards were discovered on tiny islands off the Vogelkop Peninsula of Papua in Indonesia. Varanus macraei, found on the island of Batanta and described in 2001, is “one of the most spectacular reptile discoveries anywhere,” the WWF report states. Growing up to a meter (39 inches) in length, this species is black with a pattern of turquoise and blue. Scientists also identified 218 new kinds of plants, nearly 100 of which are orchids. New Guinea still has Asia’s most pristine rivers and wetlands. Its surrounding reefs, in the heart of the Coral Triangle, have the world’s highest concentration of coral and reef fish. Large forest areas on the island are being cleared for oil palm monocultures, destroying critical habitat for many endangered species. The forests are usually cleared by burning, which releases huge amounts of greenhouse gases into the atmosphere and accelerates climate change, WWF points out. Certified Sustainable Palm Oil guarantees that social and environmental safeguards have been met during production and that high conservation value forests have not been cleared to produce the valuable edible oil, which is also used to make biodiesel fuel. Based on a third WWF report, “Living Forests,” more than 230 million hectares of forest will disappear around the world by 2050 if no action is taken. The report proposes that policymakers and businesses unite around a goal of Zero Net Deforestation and Degradation (ZNDD) by 2020 as a global benchmark to avoid dangerous climate change and curb biodiversity loss.